After the busy days of summer – with its frequent coming and going, outdoor activities, and traveling – you may find it hard to get back into a routine for the new homeschool year. Not only are you adjusting to a new schedule, you are also adjusting to spending more time indoors. Having an organized homeschool year can help the transition go more smoothly as you settle into the familiar routine and schedule of homeschool. Pray – I think it is very important to spend time in prayer for the new homeschool year. Asking for the Lord’s blessing over your children’s education, the curriculum choices you have made, and for everyone’s attitudes is a great place to start! Plan – No matter what kind of homeschooler or planner you are, having some sort of plan is best. I am more of an “open & go” and “just do the next lesson” type of planner, but have found that taking the time to at least look over a calendar for the coming year, blocking out any known vacations or times off, and just getting an idea of how the year will look goes a long way in easing my mind and helping me feel better prepared. School Supplies – Even homeschoolers have a school supply list ! Look over the curriculum and take note of any supplies or resources that you will be needing early on in the school year. Having the needed supplies for all science , art, or history projects purchased and ready for the first few weeks, or months, of the school year can cut down on the chaos of a new homeschool year. And don’t forget to have enough pencils, notebooks, and erasers on hand! Bookshelf Space – Now is the time to declutter the bookshelves ! Clear out any books that will not be relevant to the new homeschool year and make room for the new books to be read throughout the year. I like keeping a fresh selection of books on the shelf to read to my preschoolers, so that they have something new to look forward to in the new school year, too! Store or donate old books. Make a Schedule/Routine – Create a daily schedule or routine for your household. From chores to meals to school time, write out the ideal schedule and tack it up where all can see. I do best with routines, rather than a schedule with set times. I have a routine list hanging up where I can glance at it and see what should be done next. It can be something really simple like ours: breakfast, morning chores, Bible Time, school, lunch, afternoon chores, free time, dinner, chores, bedtime routine, family Bible Study. It keeps things moving productively throughout the day. Assign Chores – Another year has passed and your children are all a year older and more capable. Now is a good time to go over the chore list and reassign chores and add new chores for your children, depending on age and ability. Make sure to talk to your children about the new chore system and spend a week or two helping them in their new chores until they feel confident doing them on their own. Create a fun chore chart and hang it where they can easily see it. We have a saying: “work before play keeps the idleness away”. Simplify – Do all you can to simplify and streamline your household chores, meals, toys, laundry, etc. before the new homeschool year starts. Purge and declutter stuff, do some meal planning, and put simple rules in place for your children to help you keep up on the clutter. One of our main household rules is: “put it back where it belongs”. It really helps. I also have a list of minimum household chores I must get done everyday. These simple chores do not take much time to complete, but are enough to keep my house running smoothly even on days when I feel like I am barely surviving! Keep It Fun – With a new homeschool year comes a lot of expectations, goals, plans, and schedules. I think these are fine and help us to be focused and responsible for our homeschool. However, it can be overwhelming for both mom and kids. Everything can start going downhill fast when things are not up to par after 1 or 2 months of the new homeschool year. I think it is important to have fun, carefree activities planned daily or weekly so that everyone gets a chance to relax and relieve stress. Another important saying we have is: “all work and no play makes for a very sad day”. Those are my 8 Things For An Organized Homeschool Year. 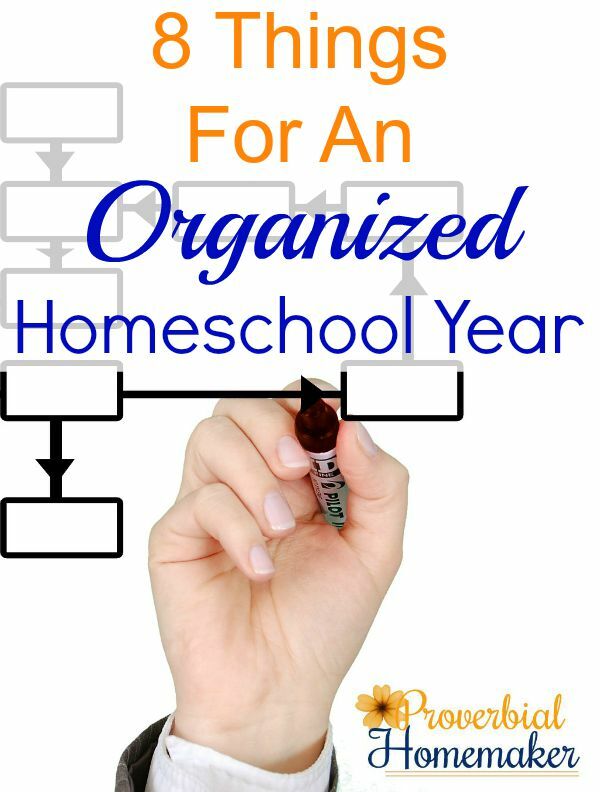 How do you get organized for the new homeschool year? Please share in the comments! 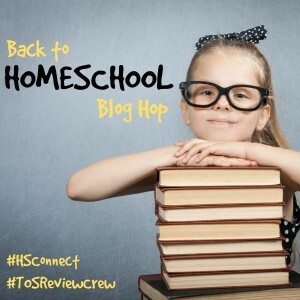 This post is a part of the Back to Homeschool Blog Hop with The Schoolhouse Review Crew and Homeschool Blogging Connection. We’re bringing you a week full of back to school encouragement. We have 56 homeschool mom’s sharing their combined wisdom and insights covering everything homeschool related. That’s 280 posts of encouragement and information just for you! Come check them out. Yes, I am all about routines over schedules! Glad you can relate! Thank you for this, some of the things I do but I am feeling very much paniced as this year I will be moving in the beginning of the schol year so now I must start our routined schooling late September or Beginning October. I am glad this encouraged you! I am in a season where I am trying to get fewer newsletters, but yours is definitely safe. You are straight forward and practical. I am so very grateful to have found your site. Thank you for everything you pour into this, because it definitely blesses me. I am blessed to get to write for Tauna here at the Proverbial Homemaker! She does have great content! Thank you so much for this! We are new to homeschooling. Actually this is our first year. Homeschooling is not a topic that you can hear or read a lot here in the Philippines. Your blog is very helpful to us — newbies….